All kittens require early socialization in order to become good pets. It helps kittens learn to interact with other cats and pets as well as people, and it requires positive interactions. Socialization also helps build confidence in young cats and makes them feel secure in their home environments. Taking the time to properly socialize your kitten now is like giving it emotional health insurance that will stay with your cat for all of its nine lives. Cats can be trained at any age and they continue to learn throughout their lives. Kittens are furry sponges that absorb lessons—both good and bad—at an incredible pace. The prime kitten socialization period is a narrow window during babyhood when learning the "wrong" lessons can emotionally cripple the cat. For example, kittens not exposed to positive experiences with humans during this period will be wild (feral) critters and never accept people. Proper socialization teaches a cat how to be a cat, proper feline manners, how to communicate with other felines, and who the cat's friends and enemies are. The age when kittens are most receptive is between 2 and 7 weeks of age. Since kittens start learning so early, most of the "life as a cat" lessons should have been done by the time you adopted the kitten. There's a reason people use the term copycat: Kittens learn by watching their mother and patterning behaviors after her. If a cat mother is buddies with a dog, her kittens will accept dogs as a safe part of their world. But if the mother cat goes into hysterics, that's a lesson the kittens will have a hard time un-learning. 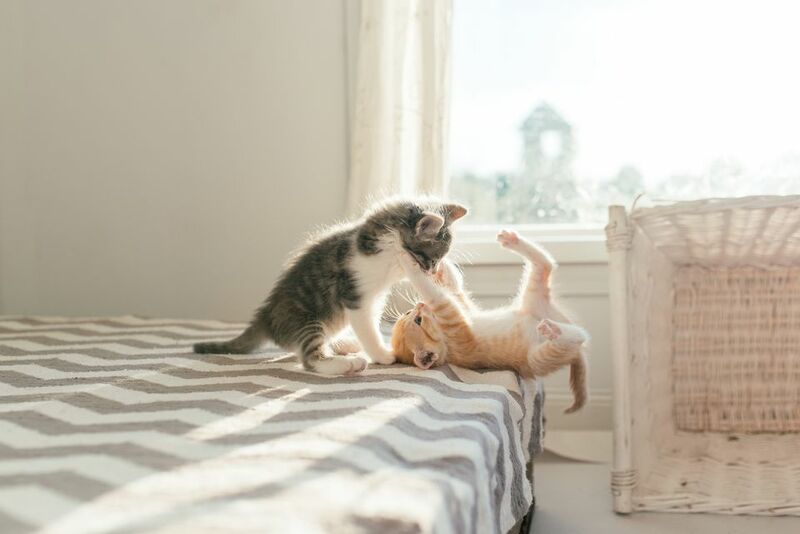 The littermates teach each other about claw and bite inhibition, and how to pull their punches during play. Interactions with each other and with adult cats give kittens practice with the kitty language of meows, fluffed fur, and tail or body positions. Singleton kittens—the only kitten in a litter or one who is separated early—can have a difficult time learning to get along with other cats because they simply don't speak the same language. For that reason, it's ideal for kittens to stay with their mother and littermates as long as possible; 10 to 12 weeks is optimal. And people raising or fostering litters must begin positive lessons before the babies go to new homes. Of course, shelters don't often have the luxury of keeping kittens that long, so kittens may be adopted as early as 6 or 8 weeks. While humans can't duplicate Mom-cat lessons, you can offer some guidance. Youngsters have an increased capacity for learning, so it's helpful for new owners to continue these lessons for several weeks after adopting a kitten. It's vital that the babies be exposed to positive experiences with other pets and people if they are to accept them as part of their "family" and become loving well-adjusted pets. Kittens can be socialized based on the three T's: touching, talking, and timing. Touching your kitten often is a vital part of socializing your new arrival. Petting is one of the first sensations newborns feel when their mother licks and grooms them, and petting harkens back to this wonderful safe experience. Petting feels good for both of you and it teaches your kitten that contact with people is pleasant, self-rewarding, and in no way scary. This is particularly important given your kitten's recent move to a new home that is filled with unfamiliar sights, sounds, objects, and family members. Cats are all about scent marking and petting places your scent on the kitten. This helps your kitten associate your smell with feelings of well-being. It also acts like a possessive marker saying that the two of you belong to each other which can really strengthen your bond right from the start. There are physiological benefits as well. Pleasant touch prompts a reduction in blood pressure and heart rate and can change brain wave activity. This can set your kitten up for a lifetime of calm interaction and good health. Studies have shown that handling furry babies for five minutes a day during their first three weeks increases the pet's ability to learn later in life. No matter its age, when you bring your kitten home, that five minutes should be an absolute minimum for daily petting. Try to pet your kitten as often as possible, even if it's just in passing as you walk around the house. Take the time to sit down with your kitten for a few brief petting sessions each day and give it your undivided attention as well. When handling the kitten, be sure to touch its ears, tail, paws, and mouth so the experience is pleasant and routine. Your veterinarian will thank you for this when the little one is a star during exams. You'll also get to know your kitten more personally, which can help you spot any health issues that may come up. Talking to your kitten teaches the youngster to listen and pay attention to your voice. It may not understand all the words but it will recognize if you're happy, aggravated, amused, or affectionate. The more you speak to your cat, the better it will learn to understand and react to what you want. That enhances your relationship and sets a good foundation for training now and in the future. Talk to your cat as often as you can. During your petting sessions, use a soft, soothing voice so the kitten associates this time and you with affection and security. At other times, make sure your tone reflects the mood of the moment. For instance, during playtime, your voice should be bright and cheery and when you need to correct the kitten, use a firm and stern tone. Timing helps the kitten learn how to live in your home. Kittens won't know what's right and wrong unless you tell them at the right time. If your kitten leaves an aromatic bathroom deposit on the carpet, for example, and you find it 20 minutes later, it won't have a clue why you're angry. Only when you catch the kitten in the act will the youngster be able to connect your displeasure with the incident. It's actually more powerful to use timing to catch your kitten doing something right. Praise the kitten when it uses the litter box correctly. Offer a treat when it greets visitors with happy purrs. Celebrate with a favorite chase-the-feather or other game when the kitten plays nicely with other pets or people. It's important that you fill your kittens first weeks in its new home with positive experiences. This is a critical time that will help shape your cat's personality and behavior for its entire life. For this reason, it's best to avoid as many negative interactions as possible. Try not to raise your voice or yell when you're angry with your kitten. This can frighten the kitten and develop a life-long fear or anxiety that may hinder your attempts at socialization. Be sure to involve your entire family in the socialization process. Introduce the kitten slowly to other pets as well so it learns how to interact with them. Even kittens who are currently the only furry family member will be better off being exposed to dogs or other cats. This is particularly true if there's a possibility you'll be adopting another pet in the future. If you adopted a singleton kitten, you will need to work even harder at socialization. You will want to simultaneously take on the role of mother, playmate, and teacher of the lessons it should have learned from other cats (to best of your ability, of course). Some people find that it's actually easiest to adopt two kittens that are nearly the same age when one is a singleton. This can really help the two learn from each other. Behavioral issues in cats often stem from the unfamiliar. Even something as simple as rearranging the furniture can be stressful to adult cats. You can help your kitten become more accepting of these changes later in life by introducing change when they're young. Move the furniture, provide new toys and hiding spots on a regular basis, and introduce your kitten to new people often. Engaging your kitten in a variety of fun and interesting things will help it grow up to be a well-adjusted cat.